Earlier this week, David Berman, primary tentacle of Silver Jews, posted what amounted to a disturbing (if true) revelation to his many fans and admirers: His “…gravest secret. Worse than suicide, worse than crack addiction — his father, Robert Berman, aka Dr. Evil. This followed a post announcing the end of Silver Jews and Berman’s career as a songwriter… moving on to other means, perhaps screenwriting, as he also alluded to in our interview. “This winter I decided that the SJ’s were too small of a force to ever come close to undoing a millionth of all the harm he [Richard Berman] has caused,” Berman wrote. A Jan. 31 show at Cumberland Caverns in McMinnville, Tenn., will be the last of the Joos. Either way, the records left behind are nothing short of legendary and I feel fortunate to have seen the Silver Jews on each of their two tours. Read the thread at Drag City and see some other reactions here and here. Republished below is an e-mail interview I conducted with David Berman last September, for LAist. September 2008: Silver Jews is coming to town. On just the second tour of a 20-year career, DC Berman and his familial touring band will visit LA tonight behind its sixth recording, Lookout Mountain, Lookout Sea. Berman answered a handful of questions from the road, via e-mail. I build their walls and then lay siege to them for weeks. It’s a dialectic between the artistic voice and the critical voice in my head. It’s like playing chess against yourself. Switching chairs back and forth. I give up faster or I won’t give up. I waste less time while putting in a lot more. Do you start with the music or the words? Does conception start with the sperm or the egg? The moment of their meeting is the first signal from inside the song. How does your approach to writing songs differ from that of writing poetry or prose? It’s less infected with self-conciousness than the silent arts. Songs are able to merge with the hive mind, and also make excellent escape pods. Has your relationship with the guitar changed after years of making records and now, touring? We make good neighbors, but it’s not with me when I’m swimming or dealing with paperwork…. I hurt my thumb in Ireland in May and never really went back to using it live. I travel with it to keep my callouses. If you lose those you won’t play. Do you feel you’re a more confident or more skilled guitarist now? Pick up any new chords or get into any sound-tech or tone geekiness? No. None of these things have happened. I’m still a novice of the rawest kind, after twenty years. I like to keep it that way. I look for advisement from guitarist friends. What kinds of guitars do you like and why? 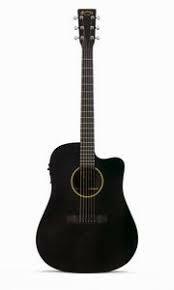 i have this Martin electric/acoustic that ‘s made of black formica. really cool. mostly i write on an unplugged Mustang or a BabyTaylor. Are we gonna see you take any blistering solos anytime soon? On the next album I’m going to satisfy my urge to solo. What musical — or other — things would you like to do in the future and is anything out of reach? I’ve got a book of drawings “the portable february” coming out this spring. Harmony Korine is walking me thru the writing of a screenplay I hope to sell. Do [wife and bassist] Cassie’s songs evolve differently than yours do? She’s written a handful of songs but she’s still in her apprenticeship stage. Do you ever fear running out of songs? When i was younger i was worried about that so i stockpiled thousands of ideas to be developed “later”. As long as i have the time ill have the material. Do you feel pressure to keep making songs/records now that there is this touring group depending on you as the generator-of-material? I feel pressure to survive. To pay my bills and protect cassie and i from bosses and businessmen. How do you find new music? Do you have certain friends that show you stuff? I no longer seek it out. Novelty, if it occurs, is pleasurable, but variations on past work, is in the main, what’s out there, and i have four lives of reading to do and no time to sample fashion, which music is just a form of presently. Have you ever heard other groups cover SJ tunes? Any favorite cover versions by any particular groups? Very few have. The Pastels. Mountain Goats. That’s all I can think of. We aren’t too big with other acts. Are Joos at an appropriate level of popularity for you? Or is it time to step it up / step back? I’ve never done much to try to build an audience. If this isn’t doing it , then it’s natural that i should move on to something more lucrative, like screen writing, in order to survive old age. Photo of David Berman by el kay photography via flickr. Props to Dudatron for helping w/ the interview. layin' siege this week — might be getting close with one.